Let's face it parents, the month of December is usually packed with travel, family, and vacations! This can be a stressful time of the year. So this month we are going to focus on how to deal with stress. time. 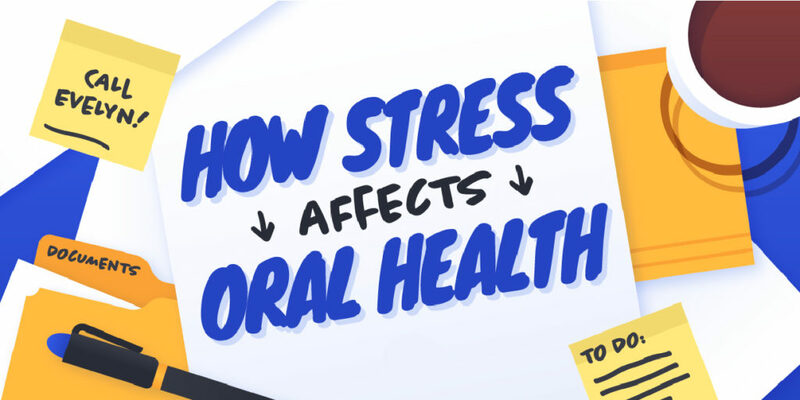 Most people associate stress with major health issues, such as heart attacks or ulcers, but do you know how stress can affect your oral health? your teeth (or the rest of your body). Junk food, sweets, sugary drinks, sodas, and chewing gum are just a few examples. When these substances interact with your teeth, they can do a lot of damage in the way of gum disease and tooth decay. flossing routine will not be forefront on your mind. and some relieve instead of taking the time to brush first. decay and can cause more pain and stress later on. Well, lots of people grind their teeth as a physical way to deal with stress, this is evident in children's teeth, too. You may be doing it without even realizing it! Ask a partner or someone who knows you well to tell you if you have this habit. What does tooth grinding sound like? It has been said that it sounds like nails on a chalkboard or someone chewing on rocks! Either one sounds extremely bad. What can help relieve tooth grinding? A nightguard MAY be a good option to relieve tooth grinding and thereby decrease some stress. Nightguards are custom made so that they do not flop in your mouth, while sleeping. They are made to cover either the upper arch or the lower arch of teeth. In either case, talk to your pediatric dentist, if your child or teenager has excessive tooth grinding. or injuries we may have. you — and that includes a healthy mouth for a lifetime!